We were recently asked to review the new Fresh Pots babies meals from Food Babies Love and my little hungry pot aka little Mister was very happy to do so with me! Food Babies Love was founded by Melbourne based mum Emily Dupuche out of pure love of introducing her twins to solids. After realising that many parents found that phase of parenting challenging, Emily published her now Aussie best seller book Food Babies Love in 2012. Her goal is for every parent in Australia to expose their little ones to good food either using her book and creating their own or by getting their hands on her recently launched FRESH baby and toddler meals - Fresh Pots. There are 7 different Fresh Pots and we got to enjoy all but one which was the 10 months + Spaghetti Bolognaise. The Fresh Pots are separated by stages at which bubs should be introduced to solids from smooth to chunky texture. Fresh Pots Early Proteins range 6 months + has two flavours - Red Lentil Dahl and Chicken, Apple & Pumpkin. 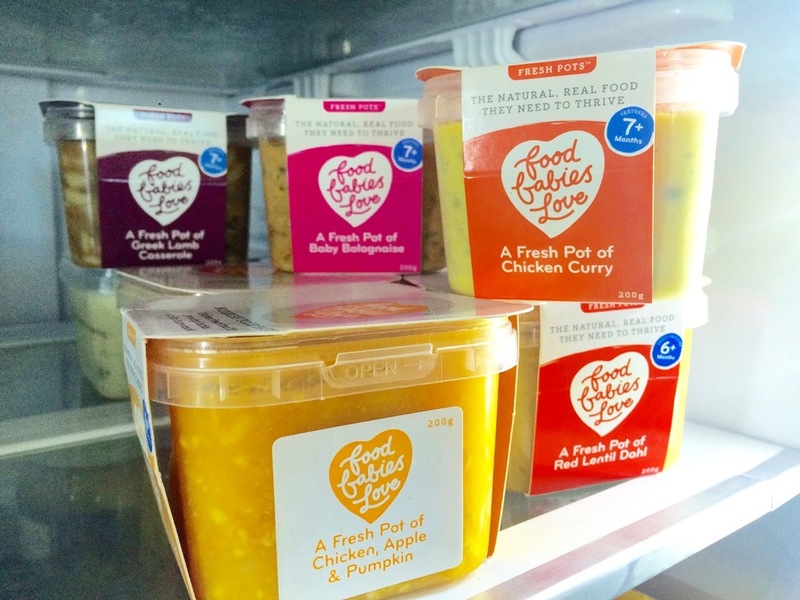 Fresh Pots Textured Meals range 7 months + has three flavours - Chicken Curry, Baby Bolognaise and Greek Lamb Casserole and Fresh Pots Toddler Meals range 10 months + has two flavours - Spaghetti Bolognaise for little ones and Fish Pie. All Fresh Pots are $6.45 inc GST and can be found in the fridge aisle of selected stockists in NSW and VIC or can be ordered online and delivered within Melbourne. To find a retailer near you checkout their stockists' list. First up, we tried the Fresh Pot of Red Lentil Dahl 6 months+. I didn't get a chance to take a great pic as little Mister and little Miss were starving in the background! Thankfully within a few minutes, little Mister's dinner was ready and I escaped moaning for thirty minutes while I cook him dinner. From the first mouthful, he was hooked! The Dahl is smooth but yet textured enough for babies starting on solids and has great flavour and the added pumpkin is a nice touch and added veggie. The following day for lunch, we tried the Fresh Pot Chicken, Apple & Pumpkin 6 months+ and liked its consistency which is more liquid than the Dahl and the apple bring a bit of sweetness to the meal. Little Mister didn't mind the tiny bits of chicken which is a great source of protein for little ones. Next up, we tried the Fresh Pot of Chicken Curry 7 months+. Better than my own curries any day of the week, this meal has lots of flavour and a touch of sweetness from soft apple pieces and sultanas. Packed with lots of veggies, chicken mince and brown rice. By far little Mister's second favourite meal! Add some homemade apple & pear purée to the meal if you think bub is ready for the flavour but needs a bit more liquid in his meal for now as the 7 months+ meals are a step up with lots more texture for little ones. As always with solids, make sure bub sipped lots of water during his/her meal. We gave the Fresh Pot of Baby Bolognaise 7 months+ a go. This meal was much more textured and thicker than other meals because of the pasta but packed again with veggies but light on tomatoes. As little Mister was gradually making his way to more textured foods I mashed the pasta and softened the carrots a bit to make it easier for him to eat but he loved it! The Fresh Pot of Greek Lamb Casserole 7 months+ was also packed with flavour and veggies. I like how Food Babies Love pack their meals with lots of veggies. I personally liked this meal myself as it has lots of flavour and the lamb shoulder bits are delicious. Little Mister loved it too! Again lots more texture with risoni pasta so make sure bub is ready to eat chunkier pasta. Last but not least, we tried the Fresh Pot of Fish Pie 10 months+. Some health professionals recommend that fish be introduced from 8 months of age while others say to hold off until 12 months. It all depends on what bub is eating and if he or she has any allergies. I had fed soft steamed Australian rockling fish with a tomato sauce recently so I was happy for him to try a bit of this dish. This meal has lots of texture and has a creamy consistency from the soft potatoes. We loved Food Babies Love Fresh Pots and honestly it was hard to pick a favourite as little Mister was happy eating everything as he progressed on his solids' journey. Little Mister's favourite Fresh Pots were the Red Lentil Dahl, Chicken Curry and Chicken, Apple & Pumpkin. He loved the smooth texture of the 6 months + Fresh Pots and loves the natural sweetness of the Apple and Sultanas in the Chicken Curry. Food Babies Love Fresh Pots are so convenient that little Mister and I are hooked and have already recommended these to friends with bubs or expecting one! There's nothing like a cranky hungry baby around 5 o'clock and a crazy sister to make it worse and feeling tired and stressed after a long day and trying to cook something quick to keep them at bay! These Fresh Pots are so easy to heat up in a couple minutes and taste fabulous I don't think I was ever spoilt as a child when I was starting solids, I know little Miss wasn't as my cooking leaves a lot to the imagination! The great thing about Fresh pots is that all ingredients are listed on each pack and there is no added salt or sugar and NO artificial colours, flavours or preservatives which is very important for us! The price is reasonable considering the large portion in each tub. If your little one isn't super hungry you could make two meals out of a Fresh Pot and keep the rest for dinner or lunch or heat up the lot see how he goes and had a quick snack yourself as the meals are very parent friendly in flavour! They can also be frozen if you decide to stock up at your nearest stockist. The cool thing too is that the Fresh pots containers are BPA free, microwave and dishwasher safe, so you can keep them to heat up half of a portion or keep snacks in them when going out or keep & freeze portions of meals you've made for bub. We were also given the Food Babies Love book and a feeding smock for little Mister and it looked fabulous on him too stylish to have food on it that's for sure! I can see why the Food Babies Love book has been a big hit as it has pages after pages of recipes and great tips throughout and suggestions with each recipe, well thought-out. We have since tried a few recipes like the Potato & Leek Soup which I love as it has zucchini in it and the Mushroom 5 minute risotto with rice flakes! Overall Food Babies Love is a great brand which we now love and which is driven by a very passionate mum! If you are thinking of introducing yout little one to solids, checkout Emily's 'Introducing solids' guide on Emily's website and get the FREE 7 mistakes of feeding ebook by signing up to her newsletter. For more info on Fresh Pots and Food Babies Love, checkout their site for more details.